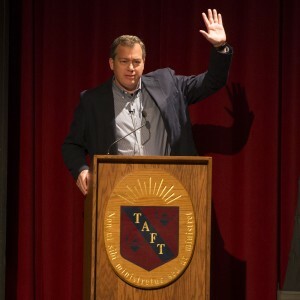 On Thursday, May 5, 2016, Dr. James Waller, Director of Academic Programs at the Auschwitz Institute for Peace and Reconciliation (AIPR), delivered an address to 600 students at The Taft School in Watertown, Connecticut as the Yom HaShoah Morning Meeting Speaker. Following his talk, Dr. Waller held a Q&A session with students and visited with classes throughout the day. Addressing the first question, Dr. Waller presented the Holocaust from multiple angles, emphasizing its differing significance with regards to historical, cultural, etymological, and theological perspectives. Stressing the enormity of the human, cultural, and developmental costs, as well as the diversity of those victimized, Dr. Waller drew connections between the Holocaust to other genocidal events in modern history and the continuation of similar atrocities into the present day. With regards to his second question, Dr. Waller began by highlighting the broad spectrum of human responses to events like the Holocaust. He explained that our capacity for a range of behavioral reactions: from resilience to good, evil, and even indifference, as exhibited by those involved, all represent extremely valuable lessons. He then discussed the utility of the Holocaust as a lesson that informs contemporary efforts to avoid future genocide. Finally, Dr. Waller pointed to the emotionally transformative nature of the Holocaust as something that can and does augment our capacity for empathy and compassionate action. Some of you in this room are going to change the world. You are going to do the unexpected that will lead to the improbable. But that doesn’t have to wait. Those are tasks, before us, that can start today. And I think, in recognizing that, we are recognizing the greatest act of remembrance that we can have about the Holocaust. A video of Dr. Waller’s address can be found here.